For a long while, I’ve used munin along with a few custom made munin plugins to monitor a server of mine. Recently however, there’s been a few interesting new offerings on the market that aim to make monitoring more flexible, so I decided to give it a go. I quickly ended up with collectd as the monitoring agent, given it’s extremely lightweight, around for more than 10 years. It also supports sending its collected data in numerous different formats, making my choice on the server side more or less independent. For starters, I tried the ELK stack. However, given that I’m particularly conscious of resource usage, I had to eliminate this early on. In my setup, with which I’m using a sole and small monitoring server, it was impossible to get ElasticSearch to run for more than a couple of days before running out of heap space. The week that I’ve been running and testing it though made me realise Kibana is just too complex to configure, given that all I need is something similar to my good old and simple munin. Having done more experiments with Graphite (a bit complex to setup), and collectd with GraphZ (more or less similar output as with munin), I ended up installing InfluxDB and Grafana. This installs the service influxdb, with the CLI executable available at /usr/bin/influx. The configuration file can be found at /etc/influxdb/influxdb.conf. The latter must be modified first, to enable gather metrics coming from collectd agents. Note that you need to change the template value of the enabled property to true (apart from uncommenting). I have also had to modify the typesdb property to a directory, telling InfluxDB to load all files as types.db definitions. This is necessary if you have custom types (which you'd define in collecd.conf with separate typedb properties). If you have no measurements listed, you’ll have to work out where things are going wrong. Chances are you need to open up the firewall to accept incoming traffic on the collectd port. So far so good. Metrics are being gathered, but we obviously need to seem the as well. This is where the Grafana dashboard comes in. I’ll use this, rather than the recently open-sourced Chronograph, as it is still more feature rich. 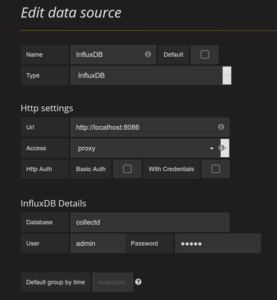 There’s still room to switch over later on while retaining InfluxDB as the data container. By default, this starts the grafana web interface on port 3000, so you could go and check grafana at http://localhost:3000. I found this a bit impractical, and therefore decided to proxy it through nginx. For this, I needed to adapt both the configuration of grafana, as well as of nginx. Restart both to apply the changes, after which I could navigate to localhost/grafana to see the grafana login screen. This brings us to a point where we can start setting up some graphs in Grafana. I’ll follow this up with some example graphs in a new post.